teamwork – Media! Tech! Parenting! Have you been ever in a work situation where you feel especially old — as younger colleagues occasionally roll their eyes, proudly demonstrating their up-to-the-minute technology skills? Or maybe you’ve seen more experienced workers shoot down younger worker’s ideas. Lots of people in mid and late career periods, well people of all ages really, note these frustrations. It’s not all about age or technology — it’s about working together. Teams with differing ages and skills are often the most productive. While technology skills are important, collaborative skills and teamwork are more significant. In today’s fast-changing world, we are spending considerable effort teaching tech-savvy students how to work together with people who have differing perspectives and different kinds of ideas. Twenty-first Century employers are on the lookout for workers who can collaborate. Sometimes older and more experienced team members offer points of view that add innovative problem-solving puzzle pieces to a team’s project. Younger workers can push limits and eagerly try new things. Older workers can also be skilled mentors. Skilled leadership, the ability to help people form a cohesive team, is a key to success. 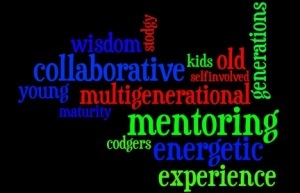 Read, Why Multi-Generational Teams Are Best, over at bNet, the CBS Interactive Business Network.